Local Area Engineer Janette Kenny with Executiver Clerical Officer Joe Mccarthy, Tommy Hartnett Cloyne Community Council, East Cork Municiaplity Chairwoman Susan Mccarthy, Eileen Eaton, Mairead McCarthy Chairwoman Cloyne Community Council, Regina Carey, Lisa O'Lamasney, Bride Cahill and Michael Greaney pictured at the official opening of the Cloyne Car Park. The new car park at River Street Cloyne was officially opened on Tuesday 12 December, providing 16 car parking spaces. 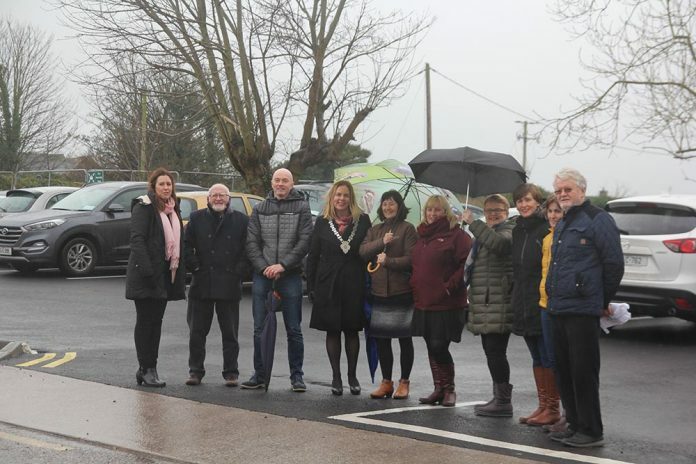 East Cork Municipality Chairwoman Councillor Susan McCarthy officiated at the opening marking the completion of a €62,500 village renewal project. The Municipality Chairwoman was joined with members of the Cloyne Community Council at the official opening. The new arrangement means that the new parking deck further enhances the villages overall parking capacity. For many years the entrance to Cloyne along River Street was blighted with derelict houses on both sides of the road. Over time these properties were acquired by Cork County Council and demolished. The Cloyne District Community Council created a community garden on the western side of the street adjacent to the former National School with the remaining part of the site being used as a temporary unsurfaced car park. On the other side of the road the GAA developed a fine new facility including accommodating a playground provided by the Cloyne District Community Council. Cork County Council created a relief road connecting River Street with the R629 east of the town centre and this created the opportunity for residential development of the adjoining “backlands”. The surfacing and lining of the car park and providing drainage and kerbing further enhances this approach to Cloyne and completes many years of hard work and improvements by Cloyne and District Community Council in partnership with Cork County Council and others. Cllr McCarthy said Cork County Council, through the East Cork Municipal District, were pleased to support Cloyne and District Community Council’s work on behalf of the community in funding completion of the car park and other enhancements through planters, heritage information signage, bins and painting of premises in acknowledgement of their community involvement and commitment in Cloyne over many years.